I’ve been on this quest for months, so I decided to advance past it. And I even have a bit of urgency since the release date for Guild Wars 2 was announced (Aug 28) and I’m hoping to finish the Guild Wars Beyond content by then, so I need to get moving! Maybe I’ll aim low and plan to finish War in Kryta and be happy with anything more. Jora and Goren had different builds – Jora was about inflicting deep wound while Goren had knockdown and the blindness condition. 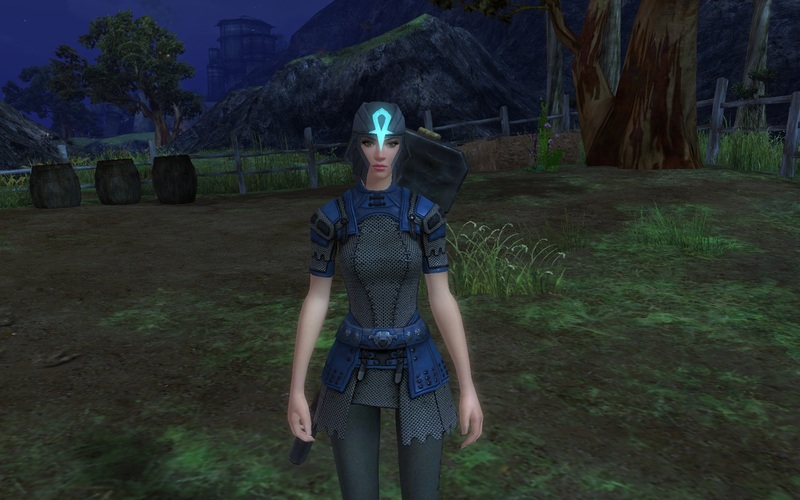 Tahlkora and Dunkoro were both healers with a few mesmer interrupt skills. I picked an Incendiary Arrows build, with Dual Shot and Triple Shot, and exited from Temple of the Ages. Once in the Divinity Coast map, the mission boiled down to carefully pulling and fighting enemy groups, preferably one at a time. 😉 Typically, I would flag my group of heroes, run ahead and pull an enemy (which would bring their allies too) back to us, and then fight like crazy. This mostly worked but one time a patrol snuck up behind us and it got ugly fast. As in: we rezzed back at Livia’s stronghold. 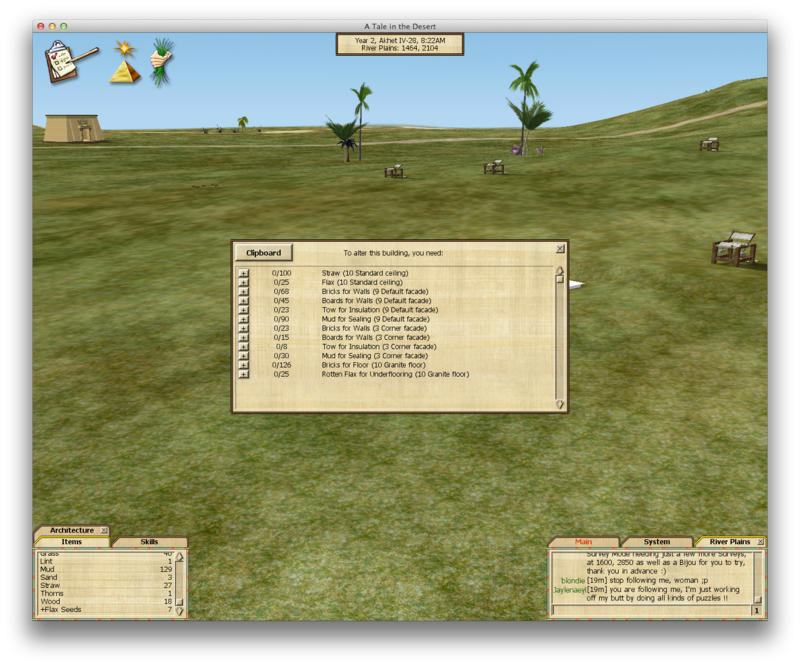 However, we bounced right back and cleared out Shaemoor after more careful battles. Energy management was tricky, so I switched to a Zealous bow midway, to take advantage of my multi-shot skills (Dual Shot and Triple Shot) and the fact most groups were a densely packed. After opening the gate to the Fountain of Truth, and fighting the gate guards, there were only a few enemies left. We charged in and concentrated on killing Aily the Innocent, since the Mursaat boss had healing skills. He eventually fell, and we were victorious! 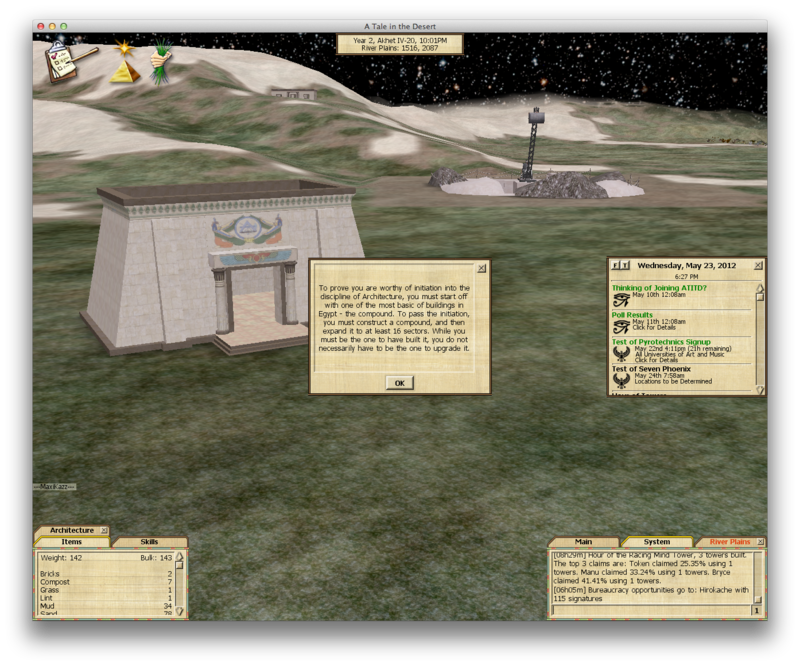 Next in the quest chain is: Temple of the Intolerable. 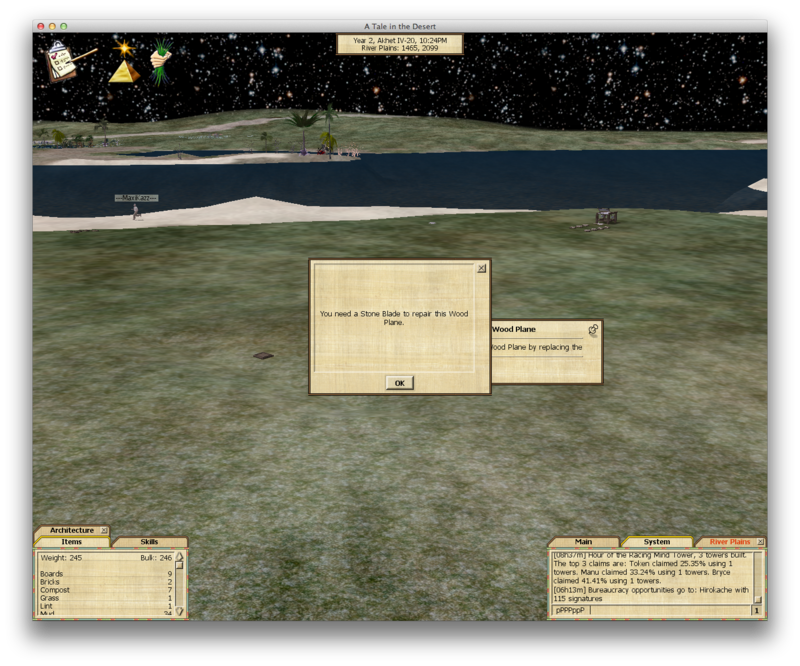 Naerys’ progress through Dunland included a tour through the Dunbog, in the southwest corner. Didn’t I fight their relatives in Malenhad? I thought the turtles looked familiar… who can forget about the Malenhad turtles, who used to drop tier 5 crafting crit items. Those items had ridiculously long names – Lethal Sharp Dread Turtle Webbed Claws – that were later simplified to a name like Dread Turtle Beaks. I’m not sure, by the time the name changed occurred, which was along with a general revamp of crafting crit items, I wasn’t hunting for them anymore. 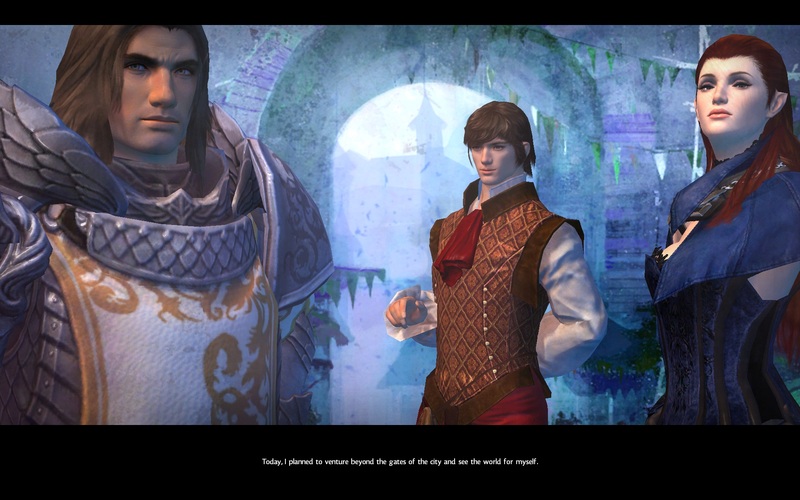 Anyway, eventually I wound up adventuring into Lhan Colvarn, which was fun. For instance, the battle above began as Naerys versus one troll, but the troll knocked her back into a misc group of rats and orcs. Basically, partway through the fight Naerys picked up several unplanned adds. This would have been cause for panic on some of my other characters, but a guardian is very survivable. My reaction was to rotate Naerys to keep the mobs in her frontal arc, and kept on fighting. Soon, all were defeated and I didn’t even have to burn any of the guardian minor panic skills! I was determined to expand the compound I started earlier, so I took stock of what I needed and began gathering and crafting it. After a lot of wood planing, flax planting, and assorted other repair and gathering tasks, I finally amassed the materials needed to finish my compound. And it is cool that I have created a building on the landscape of this game! If you go to the River Plains district, across the road from the School of Architecture near the water… you can’t miss it. 😉 Be quick though, I didn’t plant a cornerstone so the building will slowly decay and eventually vanish, unless I subscribe and get a cornerstone, or learn the repair skill and fix it up every so often. The pyramid icon at the top opens the character advancement chart. In it, the top row is highlighted (corresponds to the Architecture tests), and the leftmost icon with the double obelisks is glowing, meaning I’ve completed that task (which was to build and expand a compound in order to complete the Principles of Architecture). In most games, getting to level 2 barely requires effort. Not so in this game! I spent quite some time crafting and gathering to finish and level. Somehow that should be designed to require 2 clicks at the most. Some tasks I find annoying, such as gathering slate. It can’t be gathered until you are standing near it, and there is no visible graphic for a slate node (neither is there for sand or mud, but for those you can just walk in the beach area near water). Slate is also found near water, but in fewer places than sand or mud (which are basically everywhere). Looking for slate involves a lot of trial and error: walk a little bit, see if the “gather slate” icons appears, back track, click-click-click to search in little increments around the invisible spot that triggers the icon, etc. I need to do some hard thinking about whether or not to keep playing. I haven’t used up my free time yet (24 hours in-game), but I must be over halfway through it, if not more. Not all tests are so crafting intensive – one involves solving puzzles made by other players, another involved identifying plants, etc. This game is very different that other MMOs I’ve played. It is certainly a bold and different vision of an MMO focused on creating and building, and I kinda want to support it. What I’ll do is study the various tests available and see what kind of variety I would encounter if I decide to continue. I’d like to play something different, not just combat-based fantasy-themed games. However, I find I miss the occasional combat in this game. I mulled it over for a bit, and decided to go big and pre-order the Riders of Rohan Legendary Edition, even though it is a bit pricey. Now I can give myself a few more weeks/months to decide what to do about my 2nd account. This was an easy decision for my first account, because I should have 2 characters ready for the expansion by the time it hits – my Guardian and my Burglar. The others aren’t too far behind; they are taking it easy in the Caras Galadhon area. 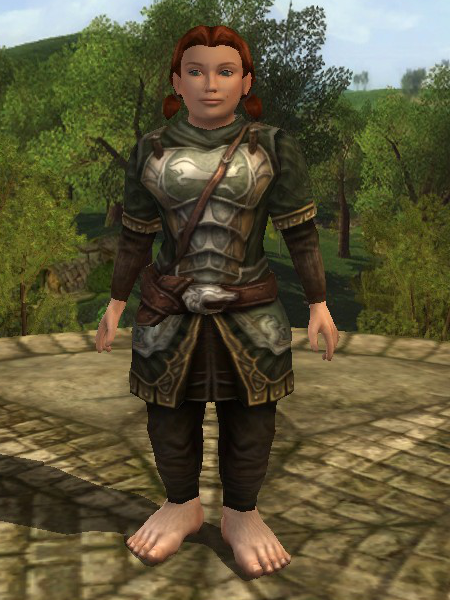 As for my second account, my Runekeeper is farthest along adventuring in Evendim, so not in any risk of entering Eregion, much less Mirkwood or even Dunland. Hence I will probably wait a bit. In the meantime, I logged in briefly on Naerys to get my goodies. First there was the pure awesomeness of the 6th storage bag. 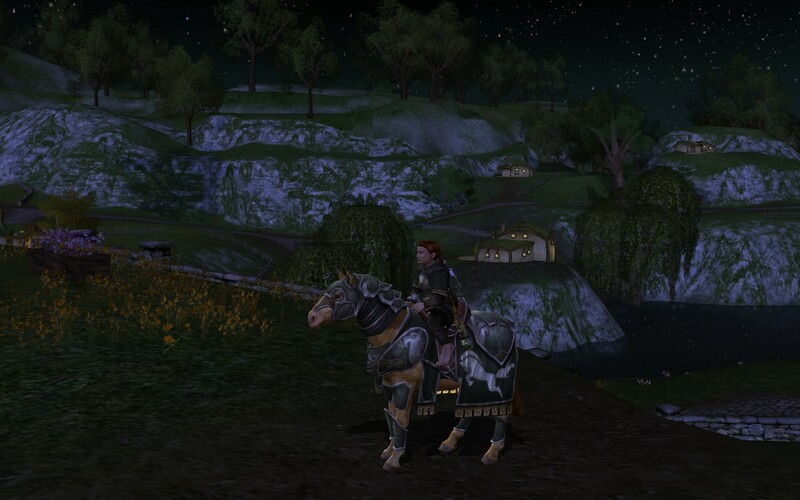 Then, I checked out my new Steed of the Easternmet, and matching armor. 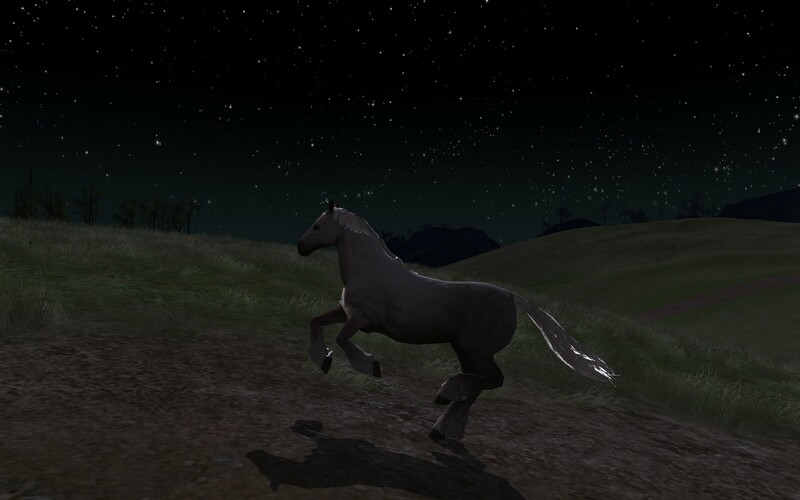 Unfortunately I am cursed with terrible timing – whenever I only have a few minutes to enter the game for a screenshot, it is invariably night. So I took a picture inside my house, by the roaring fireplace. 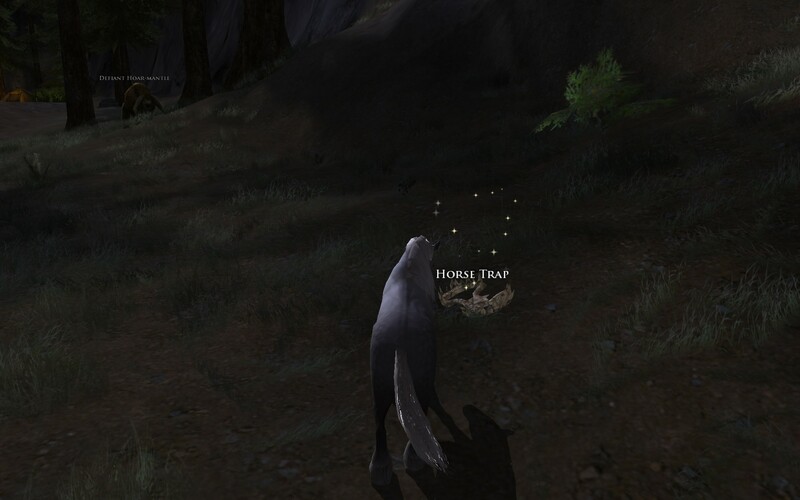 No horse since they are too afraid to enter, but that just means my armor is more visible. Here is Naerys with her Eastenmet Armor, hiding a few pieces. 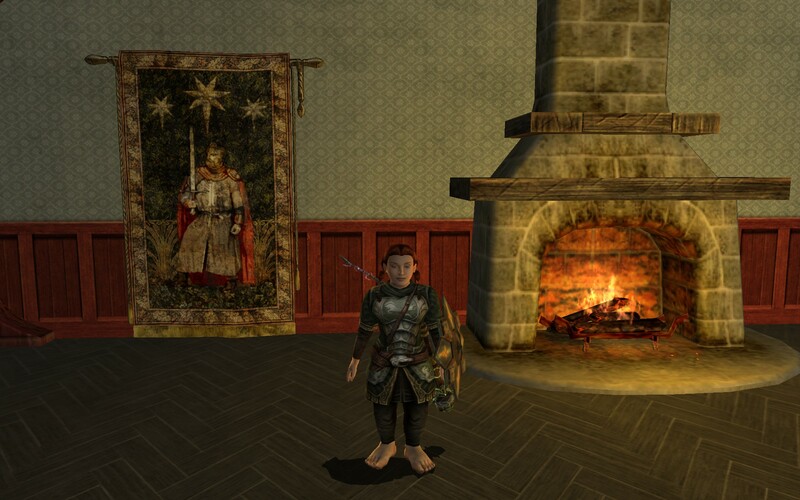 As a hobbit, I don’t display footwear because it doesn’t look right. I also don’t display helms because I like to see my character’s face. And I don’t display shoulder guards because they poke through. Finally, I usually don’t display cloaks, but that depends on several factors: how cool the cloak looks, how new the cloak and/or armor is. For the moment, this armor set is new to me, so I don’t want to cover it up. Now that we have a release date for the expansion, I have a target to aim for as far as getting Naerys and Dhrun ready! My others characters may have to be satisfied taking an extended break at Caras Galadhon. Later I had another chance to play, so I took it. I followed up on the quest line through Combe which led to the session play starting at Hengstacer Farm. After speaking to the horse, I found myself… as a horse, in the North Downs! The most fun part of the fight is turning around and using the “Back Kick” attack, which does great damage AND knocks the Orc backwards. 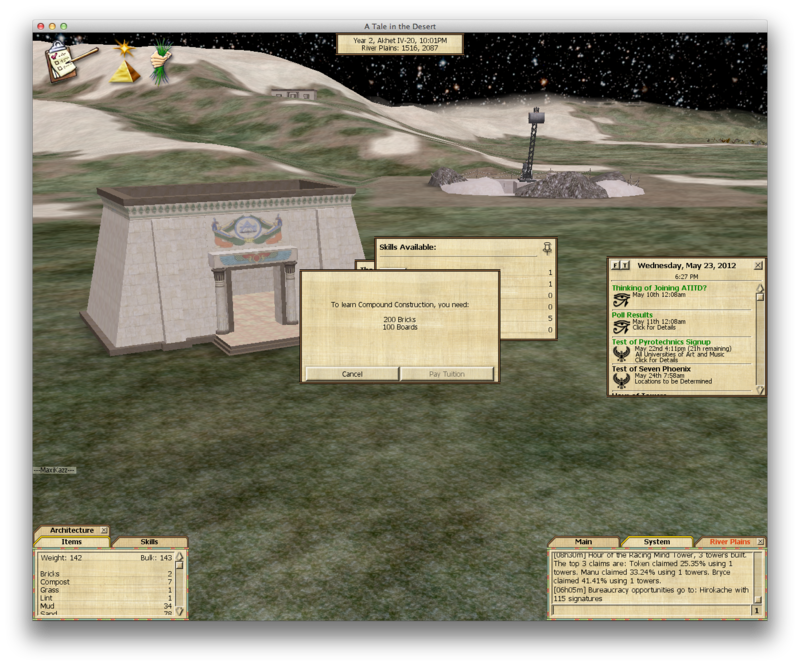 I eventually had to logoff for the evening… and realized it is always daytime at the login screen! 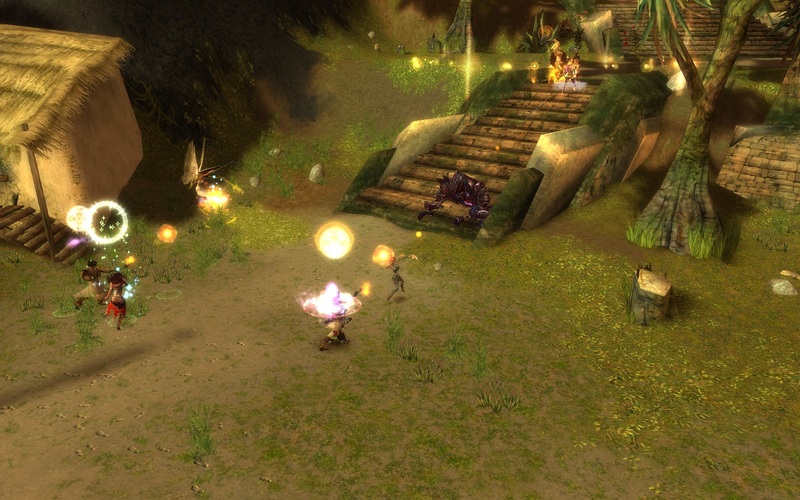 As a newly minted Level 1 Citizen, I set out to do the natural thing in an MMO – level up. 😉 Leveling works a little different in this game – instead of killing stuff for experience points, I had to finish a test. Tests are organized into groups of disciplines, with each discipline containing seven tests. Each discipline also has Principle “intro quest” (e.g. Principles of Architecture) that must be finished first. At level 1, the only tests available to me were Principles of Architecture, Principles of Body, and Principles of Harmony. In each case, completing the Principles would allow me to take further tests in the Discipline, and earn a level. The Principles of Architecture required resource gathering, Principles of Body required identifying plants within a time limit, and Principles of Harmony required talking to several other players and meeting ones with various titles. Of these, I opted to work on the Principles of Architecture. The Principles of Harmony looks like one to try later when I find a hub of players – so far I’ve only seen around 5 total. And I ruled out Principles of Body since I haven’t learned how to fast travel yet (“Exploration Travel”). Thus, I ran to a School of Architecture and clicked to see what I had to do. and the tuition is 100 boards and 200 bricks. This didn’t actually hold me up much since I ran between three clumps of trees, and by the time I was back around, the tree was ready to be harvested again. I did keep track of how much time this took, and it was 4 minutes to gather 100 wood. Turning that wood into boards was another matter – that requires a wood plane (which I had already built). So I started planing my wood into boards, but after a bit, the plane broke! Making a stone blade required slate, which I gathered… to sum up, between broken blades, gathering slate, and planing the wood, it took a total of 18 minutes to plane 100 wood into boards. Anyway, onto making bricks. Since bricks take sand, straw, and mud, I started gathering them. Sand and mud came from the banks of a nearby river, and is easy to gather since you can specify how much you want to pick up (there is even a “max” button). Straw took a while, because you have to gather grass, then drop it and wait for it to dry into straw (the bundle changes color). 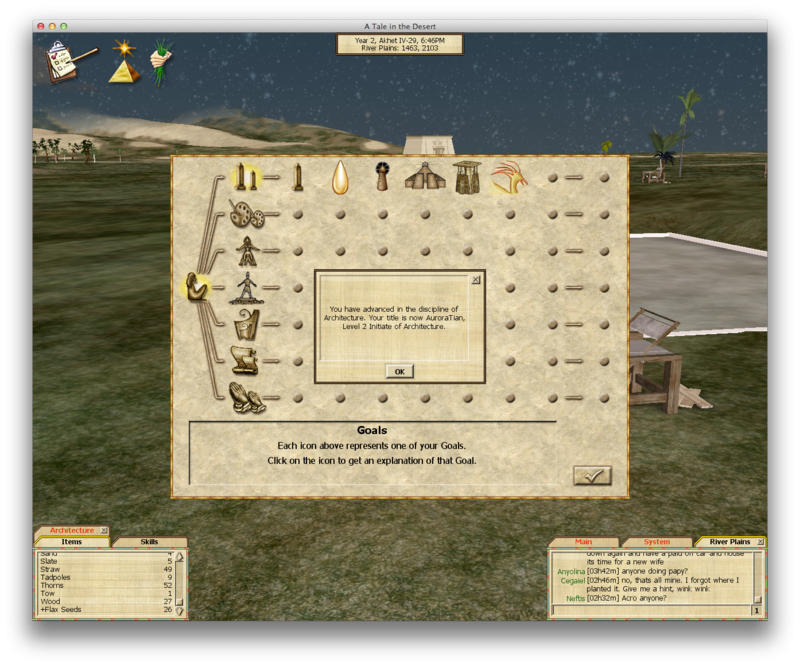 All together it took me another 23 minutes to gather resources – there was a little bit of inventory juggling in there, plus I probably wasn’t as efficient drying grass into straw while gathering more. Making the bricks took another 17 minutes (I used two brick racks) and then I ran back to the School of Architecture to pay my tuition. The next step was to build a compound, which requires… 100 boards and 200 bricks to start, and then more materials to expand in order to complete the task. OK, last time I said I couldn’t get into the backstory/culture of the Norn or the Charr. Well I got tired of Divinity Reach, so I changed up and tried the other options and made a Norn and Charr ranger. I figured I’d stick it out, after all the bulk of the content in an MMO is battle and killing enemies, so just embrace it. 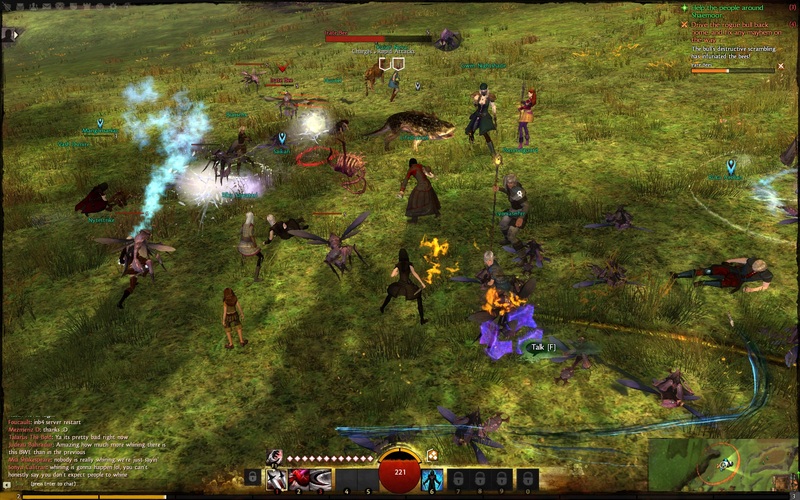 (Being tired of the human area is not a criticism of the game or ArenaNet. 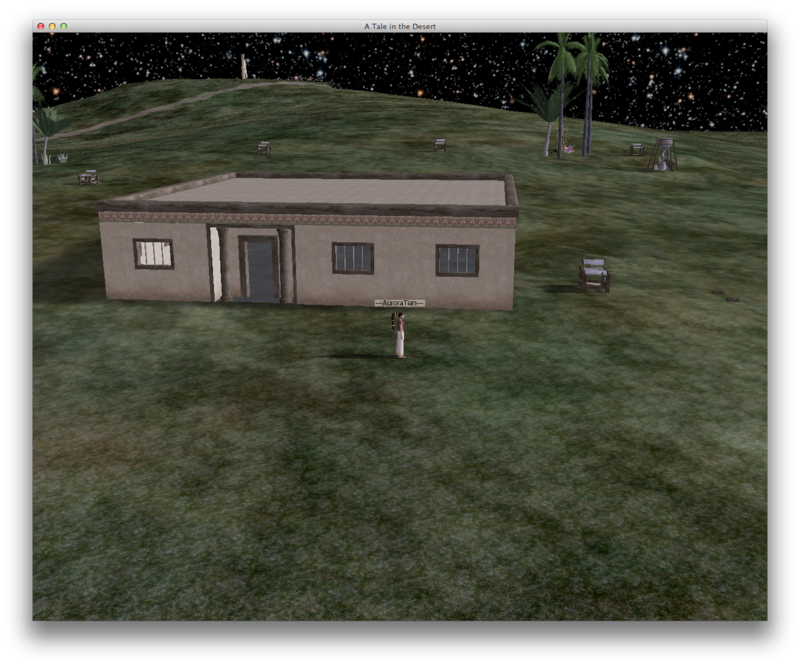 It has more to do with me fiddling with low level human characters over and over). Outside the Black Citadel, I went to fill in some hearts. After brief service at the Greysteel Armory, I was summoned to the Black Citadel to meet the Tribune… and so my personal story continued. I know there are some players/bloggers that don’t like this sort of “theme-park” MMO experience. But, I do, or I should say I like to have a storyline to follow in addition to other content and just basic exploration and fun stuff. On the other hand I can see the appeal of games more on the “sandbox” side of things, say EVE Online, where the players themselves create a significant amount of content. But a game like that requires a significant time investment where I can enjoy a somewhat guided, solo-friendly “theme-park” a little chunks of time, which is what I have available. 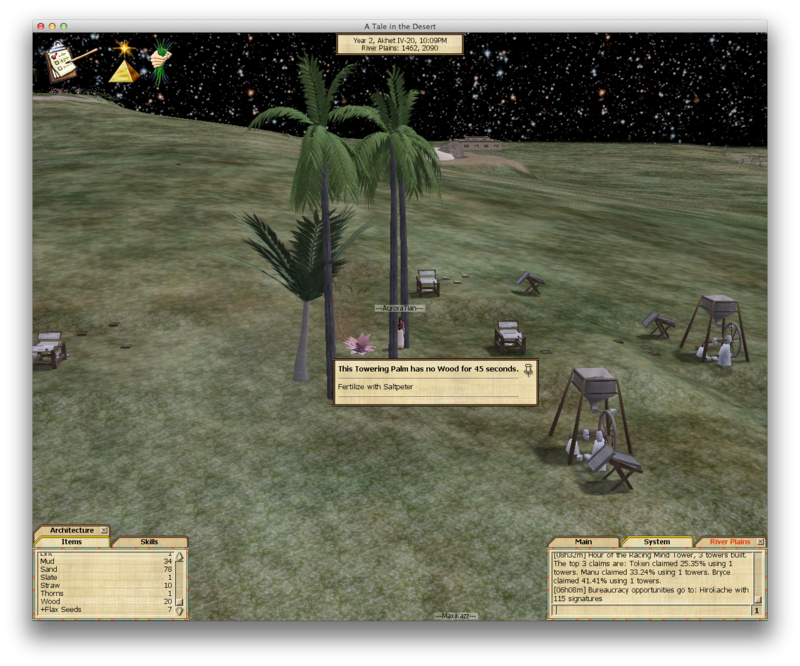 The in-game map draws green arrows to help navigate through the cities. Little green arrows show up, and here’s the cool part – they understand the landscape is 3-dimensional, and understand walls. Near a ramp or stairs, it just draws a few arrows leading you onwards, and when you continue on the same level, it draws a longer trail of arrows. That is awesome because the cities in this game are more complicated than the ones in GW. Trying to get somewhere just off a green star would mean dead ends, paths on the wrong level, walls that stop progress, all of which would be frustrating. Finally, for future BWEs, I hope ArenaNet allows players to start with higher level characters, unless they are already getting enough feedback and ratings for storyline events and other content at those levels. Like many of you reading this, I slipped out of work a little early, raced home, shoveled down dinner without chewing my food, all so I could jump into the Guild Wars 2 beta event. Here are a bunch of random thoughts. I can’t get into the Norn or Charr as a race – the whole warrior culture doesn’t do it for me. Unfortunately since the Sylvari and Asura aren’t available, that meant repeating the Human story while trying out different classes. At least I picked a different origin each time (grew up in streets, raised by common folk, born into nobility) so I saw a different story line! 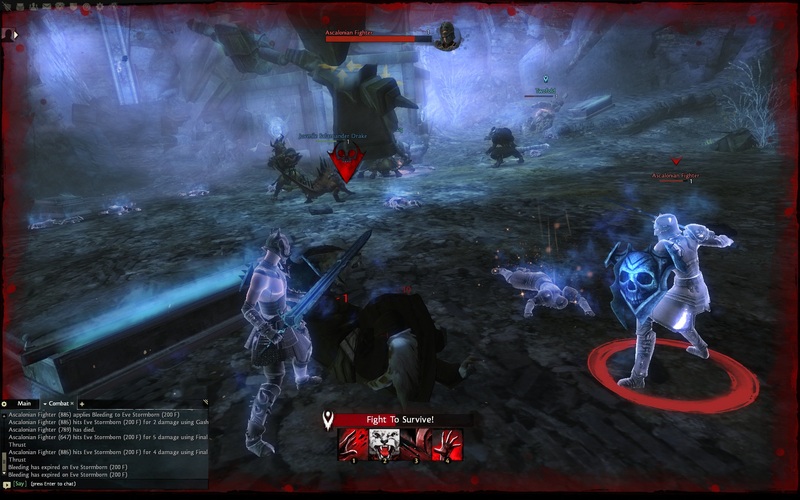 I think the intro boss elemental fight needs to be toned down – the fight after defending the garrison in the Defense of Shaemoor. I was one-shotted on a Guardian and also on a Thief just running up to fight something. That’s not so fun for melee chars to be downed without a chance to do anything. I’m sure this will be balanced a little better, tone down the spike damage is all that is needed. Granted, this intro area is finished basically 5 minutes into your character so maybe it isn’t a big deal. The group events were fun, but sometimes it was so packed I could barely see what was happening. 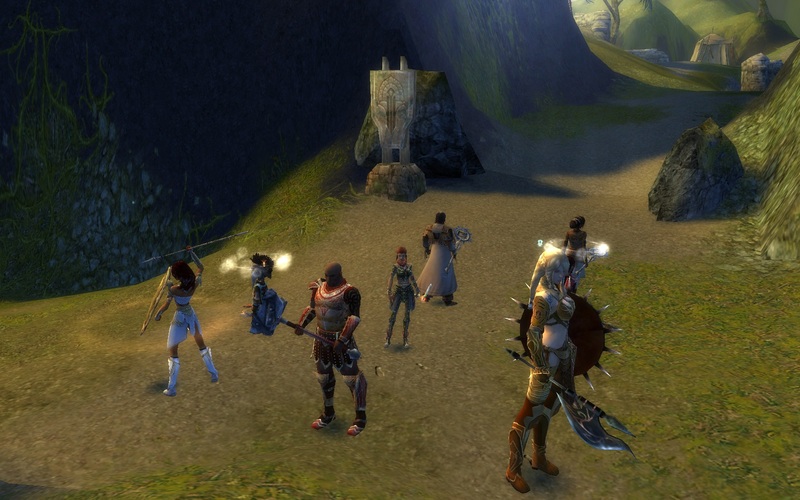 This is probably an artifact of the beta weekend and giant interest in Guild Wars 2! I really enjoyed the mesmer from GW, but the GW2 mesmer plays differently… to be more precise: I expected a difference, but this was even more than what I expected. Thus I can’t get into them just yet. Perhaps that will change at higher levels with more skills and weapons unlocked. I loved the ranger and to avoid burnout I’m not playing a ranger in beta and instead will try out new professions, like the Guardian and Engineer. I need to concentrate on one character to level during these beta events. But that’s hard for me to do given the format because I usually can’t put too many hours in over a single weekend. I’ll stick with the Guardian and hope to get more time to play this weekend. Maybe I’ll even make level 12 or so!